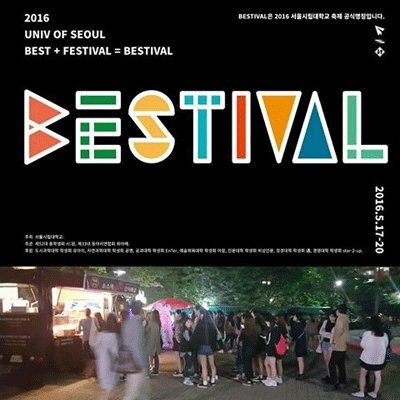 The month of May is a time for university festivals. While these festivals are mainly student-organized, with unique games and cultural performances of all sorts, there are also high-profile K-pop celebrity stages which help attract people other than university students to visit and add to the atmosphere. The celebrity line-ups often remain a secret until the day of the festival to rally up excitement among speculative visitors. 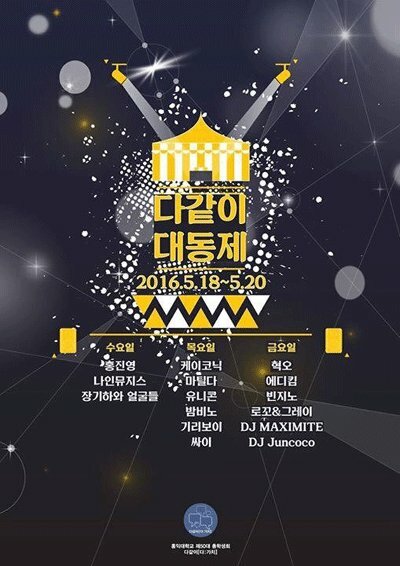 The Korea Herald has compiled the dates of each university’s festival for the third week of May and the acts that have already been made public. Before going to the list, note that cash is necessary for various games and activities at these festivals, and also for food and drinks sold at the student-run food stalls. Disclaimer: the food provided at festivals is cooked by average university students and can taste mediocre for the price. The following universities are grouped according to area vicinity. Friday (20): Buzz, Rainbow, Dynamic Duo slated for 5:30 p.m.
Celebrity line-up to be announced. ***Tickets have to be purchased for Yonsei University’s celebrity invitation concert. Tuesday (17): Rose Motel slated for 2 p.m., Loco, Jay Park and YB slated for 8 p.m.
Wednesday (18): Geeks slated for 2 p.m., I.O.I, Hweesung, Gummy and Ailee slated for 8 p.m.
Thursday (19): artist for 2 p.m. TBA, Giriboy, Vasco, Beenzino, Dok2, The Quiett and MFBTY slated for 8 p.m.